Every cell in an individual has largely the same genomic sequence and yet cells in different tissues can present widely different phenotypes. This variation arises because each cell expresses a specific subset of genomic instructions. Control over which instructions, or genes, are expressed is largely controlled by transcriptional regulatory pathways. Each cell must assimilate a huge amount of environmental input, and thus it is of no surprise that transcription is regulated by many intertwining mechanisms. This large regulatory landscape means there are ample possibilities for problems to arise, which in a medical context means the development of disease states. Metabolism within the cell, and more broadly, affects and is affected by transcriptional regulation. 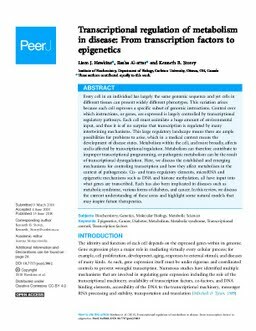 Metabolism can therefore contribute to improper transcriptional programming, or pathogenic metabolism can be the result of transcriptional dysregulation. Here, we discuss the established and emerging mechanisms for controling transcription and how they affect metabolism in the context of pathogenesis. Cis- and trans-regulatory elements, microRNA and epigenetic mechanisms such as DNA and histone methylation, all have input into what genes are transcribed. Each has also been implicated in diseases such as metabolic syndrome, various forms of diabetes, and cancer. In this review, we discuss the current understanding of these areas and highlight some natural models that may inspire future therapeutics.